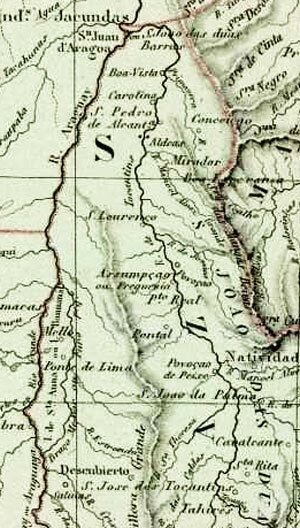 While the Portuguese capitanias were developing sugar business in Pernambuco and São Vicente (today São Paulo), the French, English and Dutch were exploring the north of Brasil. In 1610 a French expedition of 40 soldiers from São Luis travelled along the river Tocantins and reached Tucuruí. In 1636 a Portuguese padre was send to keep the indians free from French influences. Half a century later all the indian villages at the river are under Jesuit missionary control. Fathers of the Companhia de Jesus started missionary villages Palma (Paranã) and Duro (Dianópolis). Much later the Jesuits are send away in 1759 under command of Marques de Pombal. Since 1600 so called Bandeiras from Bahia, Pernambuco and São Paulo were travelling through mid Brasil, to protect cattle raising pioneers against indians and to look for gold. These were groups of armed soldiers and if not finding gold, they returned with prisoners, mostly indians. Bandeiras from the south are looking for indians to work as slaves in the sugar industry. They travelled with canoes and in later periods over land with the use of mules. From that time it were the various economic developments of Tocantins that gave rise to the growing of towns. By the way, these developments caused a constant conflict with the native indians. In the 17th century the cattle farms from Bahia grew westwards. Cattle transport happened between the states of Maranhão, Piauí and the area of the Rio São Francisco. The political center of the cattle raisers was in Comarca da Palma (per 1809). From the end of the 18th century and the whole of the 19th century, cattle raising is the main business. Towns: Araguatins, Lizarda, Ponte Alta do Bom Jesus, Silvanópolis, Taguatinga, Tocantinópolis and Nazaré. In the period 1730-1740 gold was found in the south-east of Tocantins (at that time the region was referred to as North of Goias, and the mines were called Minas de Goyazes). The mining came to a sudden end around 1800. Second half of 18th century: growing of cotton and tobacco. Rubber growing in the beginning of 20th century, developped the valley of Araguaia. The first half of the 19th century the development of river navigation for commercial use was started. The river is not navigable everywhere and indians were invading the towns. 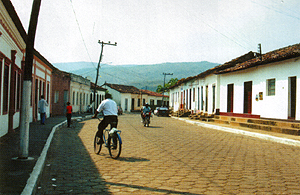 First towns: Tocantínia (Piabanha), Pedro Afonso e Araguacema (Santa Maria do Araguaia). In the second half of the 19th century the river Tocantins started to being used to transport goods to Belem. Gold, cotton, tobacco, sugar cane, meat, dried meat, leather,etc. Towns that grew: Porto Imperial (Porto Nacional), Pedro Afonso, São Pedro de Alcântara (Carolina-Ma) e Boa Vista (Tocantinópolis). In the 20th century Pedro Afonso (rubber trade) took over as biggest fleet from Boa Vista (cattle transport). River transport came to an end when the Transbrasiliana highway was build in 1960. In 1940-1950 rock crystal was explored in towns like Pium, Cristalândia, Arapoema e Xambioá. The first half of the 20th century: The extracting of oil from the Babaçu palm and Mogno happened at Araguatins. Charque is salted, sun-dried beef. Transported to Belem. The charque activities were in the mid 20th century at Pedro Afonso e Araguacema. Agriculture and food processing are the focus in the 21st century. The products will travel to the north by railroad, highway and also by water. About five cargo stations along the north-south railway in Tocantins will initiate new towns. Occasionally, the spotlight is thrown on a town in Tocantins, and its charming touristic features will be highlighted for you.